If you are interested in architecture, traditional living, design, Thai silk and arts, or just the fine things in life, then Jim Thompson’s House is a must-see during a Bangkok sightseeing trip. In the midst of chaotic modern Bangkok, you find a little oasis of peace, taste and tranquility. There you can also buy Jim Thompson merchandise, particularly Thai silk and clothing. On the upper floor, there is the Jim Thompson Center for the Arts – and you can find traditional and modern textiles and arts there. The house consists of six different teak houses, most of which are more than 200 years old. These houses were built without nails, as they always were in the olden days. That made it easy to dismantle them and move them to another location. They used to put them on barges and just float them to other areas along the Chao Phraya river. This house was not just meant as a museum – Jim Thompson was a local celebrity here, and almost every foreign visitor of importance at least dined once with Thompson. Before traditional Thai arts became fashionable, you were able to purchase them cheaply in the Thieves’ Quarter (Nakhon Kasem) in Chinatown. Nowadays, the prices have risen a lot. For example, this Buddha image is extremely valuable nowadays, even though it has no head. It was built in the seventh century, the Dvaravati period. 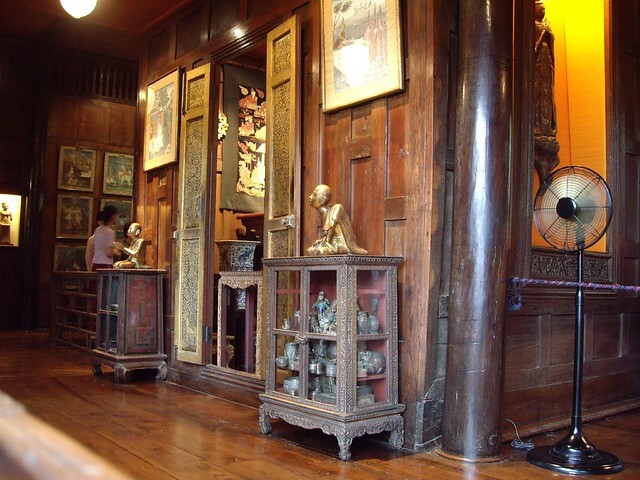 Some of the things you can see in the Jim Thompson museum are also from temples that were upcountry, where things would have just decayed because the people there didn’t see the value in them at that time, and just looked at these antiques as “old stuff”. What’s more, sometimes they believed that old things had spirits in them, and thus they did not want to own them. Jim Thompson lived a fascinating life. He originally was an architect, but started to work for the CIA (at that time operating under the name of Office of Strategic Services) in 1940. He went through all kinds of missions in Europe, Africa, the Far East and finally Thailand, where he later become the station chief in Bangkok for the future CIA. He then acquired stakes in the Oriental Hotel, but soon turned his attention to silk weaving. In the Western world, traditional Thai silk weaving wasn’t known, and it was only Jim Thompson who introduced it to the Western world and made a fortune by promoting it. In Thailand itself, Thai silk was a craft that was on the decline – the Thais at that time preferred cheaper imported materials from other countries. He had all the connections in place, and he was a very entrepreneurial character who made it his mission to promote traditional Thai arts and handicrafts. And it paid off well for him. He mysteriously disappeared in 1967. He stayed in a friend’s cottage in the Malaysian Cameron Highlands, went out for a stroll and never returned. Nobody ever found him either – despite intense search efforts. Local guides, tracker dogs and even shamans couldn’t locate his body. To get there, you can take the BTS Skytrain to National Station, or the small river taxi on Khlong Saen Saeb and get out at Saphan Hua Chang pier. Guided tours (30-40 minutes) cost 100 Thai Baht (for students and people under 25 just 50 Thai Baht) and are available between 9am to 5pm every day.